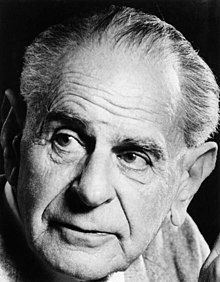 Sir Karl Popper CH FRS FBA (28 July 1902 – 17 September 1994) was an Austrian and British philosopher and a professor at the London School of Economics. He is considered one of the most influential philosophers of science of the 20th century, and also wrote on social and political philosophy, especially the evils of totalitarian ideas and politics. Popper is known for the idea of empirical falsification. Karl Popper was born in Vienna (then in Austria-Hungary) in 1902 to middle-class parents of Jewish origins, both of whom had converted to Christianity. Popper received a Lutheran upbringing and was educated at the University of Vienna. His father had 12,000–14,000 volumes in his personal library. In 1919, he became attracted to Marxism. He joined the Association of Socialist School Students and also became a member of the Social Democratic Party of Austria, which was at that time a party that fully adopted the Marxist ideology. He soon became disillusioned, stopped believing in Marxism, and was a supporter of social liberalism for the rest of his life. Popper, brought up in Vienna, was well aware of the Vienna Circle. That school of logical positivism, led by Moritz Schlick, defined knowledge (especially scientific knowledge) as being propositions which could be verified. Popper thought this was quite wrong. In his opinion, science grew indirectly, by wrong ideas being falsified. This he worked up in great detail in a series of books, of which The logic of scientific discovery is the most famous. All philosophy of science since then has had to deal with this issue, the criterion. By 'criterion' is meant: what is it that makes a theory truly scientific, as opposed to simply common sense or opinion? Popper's work on political philosophy is also of great importance. Marx claimed knowledge of an historical process, where societies evolved from one state to another, until they reached a final state. This type of thought is known as 'historicism'. Popper argued that the growth of human knowledge partly causes the evolution of human history. Since "no society can predict its own future states of knowledge", it follows that no science can predict human history. Popper's great works in defence of the liberal society were The open society and its enemies and The poverty of historicism. His allies in this struggle were Friedrich Hayek, Ludwig von Mises and Milton Friedman. "Unlimited tolerance must lead to the disappearance of tolerance. If we extend unlimited tolerance even to those who are intolerant, if we are not prepared to defend a tolerant society against the onslaught of the intolerant, then the tolerant will be destroyed, and tolerance with them". ↑ Schlick, Moritz 1974. General theory of knowledge. Springer, Vienna and New York. (transl of the 2nd German edition of 1925). ↑ Ayer A.J. 1936 [2nd ed 1946] Language, truth and logic. "A Sceptical Look at 'A Skeptical Look at Karl Popper'" by J C Lester. History of Twentieth-Century Philosophy of Science, BOOK V: Karl Popper Site offers free downloads by chapter available for public use.